Friday, June 8, 2018 at 2:53 am | ?”? ???? ???”? 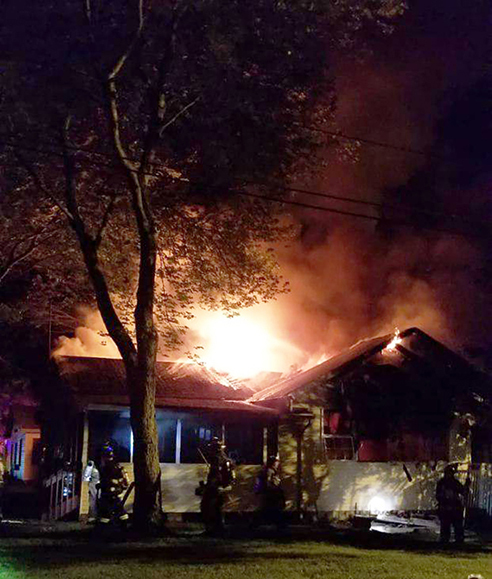 A number of bachurim from the Novominsk Yeshiva were injured following a fire that broke out juts after 12 a.m. Friday in the bungalow colony that they were to spend Shabbos. The talmidim of the 12th grade were to have spent Shabbos in the Quaker Hill bungalow, in upstate New York, with the Novominsker Rebbe, shlita. According to NBC News, Vini Tankasali, Department Commissioner of Emergency Services for Orange County said that fourteen people were injured when the Monroe bungalow went up in flames. The injured are being treated in a local hospital. One bachur had serious burns on both his hands and legs. An initial investigation into the explosion revealed that the bachurim smelled a strong smell of gas, opened windows and then the gas balloon exploded, causing the bungalow to burn. Tankasali could not independently confirm the explosion was the result of a gas leak. Tankasali said that eight fire departments were able to put out the blaze in about 40 minutes. He said the fire was in a non-fire-hydrant area so other departments were called in for water. Firefighters also came from a number of other stations in the area, including from Kiryas Yoel Hatzolah, Monsey, New Square, to help with the firefighting and rescue efforts. B’chasdei Shamayim, most of of boys were discharged after several hours. Four bachurim will remain in hospital for the next few days after suffering 2nd degree burns. Names for tefillos: Yehoshua ben Yiskah, Eliezer ben Brachah, Chaim Boruch ben Miriam Eidel and Meir Dovid ben Chayah Leah. The cause of the explosions and inferno is still under investigation.